It’s that time of year where families come together, but for the “computer geeks” in the family, holidays can easily become “family tech support” weekend. The geeks at Google apparently share my duty… and to help keep everyone remain sane this year they’ve made a new site for teaching family members a little about computers <phew>. 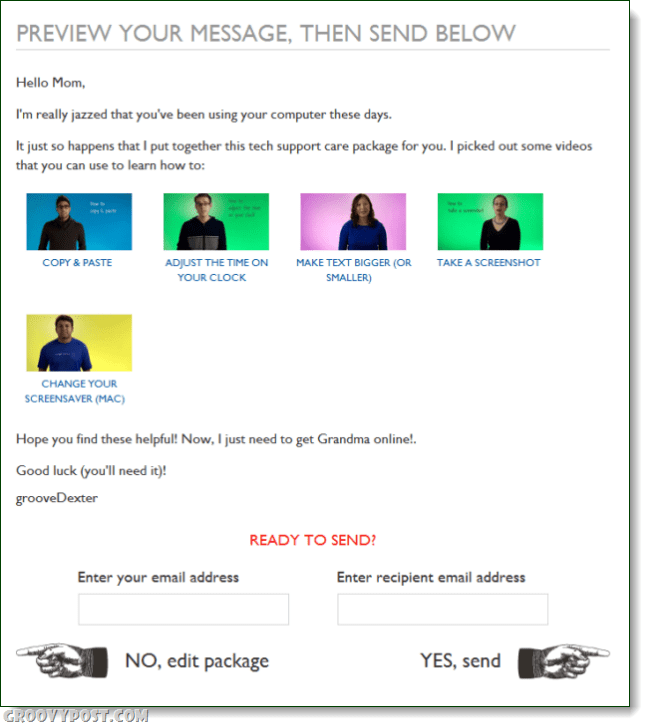 The site is called Teach Parents Tech and it’s packed full of simple how-to tech videos designed for the not-so-geeky. Yup, anyone including your non-tech parents can follow without any trouble! The TechParentsTech website works by you filling out a basic webapp questionnaire. The questionnaire allows you select which relevant video tutorials you’d like to send, along with some snarky but appropriate commentary. It’s really simple, I think in total it takes about 30 seconds to fill out. Once you’re done with the questionnaire you’ll get to preview it and then email it off to your mom, dad, or other family member who is in need of computer help. ha ha ha. love this post. Problem also is that it’s all based on Mac. Hah, what a noob! The best way to avoid these is a single, collosal failure. For example, suppose Uncle Fred has an issue with his email. You immediately dive in and reformat his hard drive–no more requests! I follow the same strategy in life. My wife once asked me to run a load of dishes. I put her crystal glassware on the top, all crammed together. I made sure to ask her to review my work and presto, no more dishes! She once asked me to help with the laundry. I put her mohair sweater in the dryer for 4 hours. I’ll never be asked to help with that again! Doug – You are brilliant yet evil nonetheless. That being said, I have to admit I’ve been laughing for about 5 minutes since I read your comment response (Smile). Very funny. Note to self – never let ShockerSH “or” Doug work on my computer.